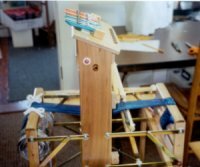 Voyageur 4s - 2120-0416 We at Leclerc designed the Voyageur loom following demands for an 8s loom with front levers and easy portability. This 4s Voyageur has the advantage of being smaller and lighter. It is for the beginner or those who just want a 4s to carry with them even for a weekend. The 15 3/4" model weighs in at 12½ lbs., comes with 400 inserted Eye Heddles, a Stainless Steel Reed and a Custom made Bag with pouch. 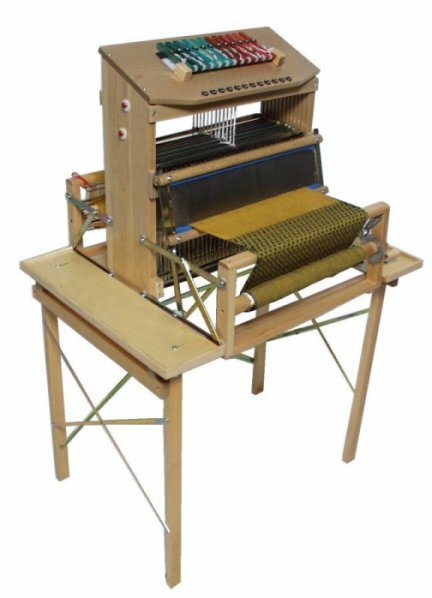 As with the 8s loom, we supply a specially designed (1" profile) Cherry Shuttle, Reed and Heddle Hook, 2 Lease Sticks, 2 Beam Sticks, the newly designed Warp and Cloth Roll lashing system, one Multi bits Screwdriver, transfer Heddle Bars and the Book "Warp and Weave" by Robert Leclerc. Our new Voyageurs are set up with Levers starting with #1 on the right (standard). 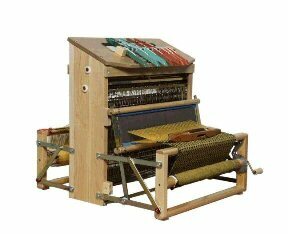 If you prefer we can set your Loom up with #1 Lever starting on the left at no extra charge. In addition for those who choose, Texsolv Heddles and the new Swinging Beater are available at no extra charge. For those who prefer even greater versatility, the Swinging Beater is also available in a Kit. The Beaters can be interchanged in a few minutes. Net weight: 12½ lbs 5.7 kg. 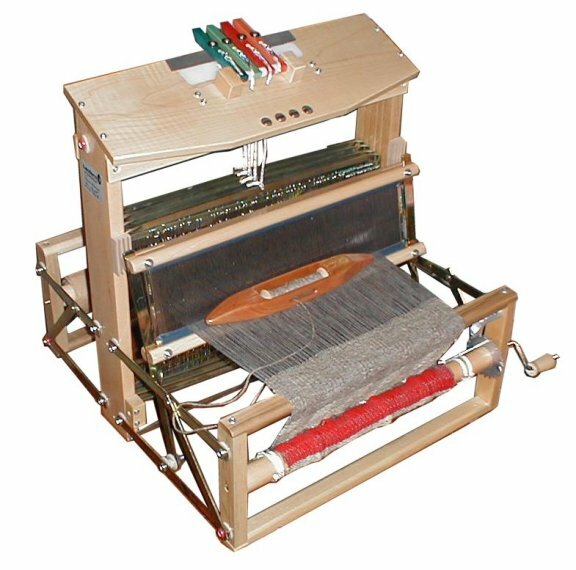 This new loom originally made for Workshop traveller's end up to be a practical loom for all weaver's, beginner's or more experience one. The 15 3/4" will weigh in at 20 1/2lbs., have 8 Shafts with front Levers, will fold for checking in at the Counter(no hassle), come with 400 Inserted Eye Heddles, a Stainless Steel (Rust proof) Reed and a Custom made Bag with pouch. 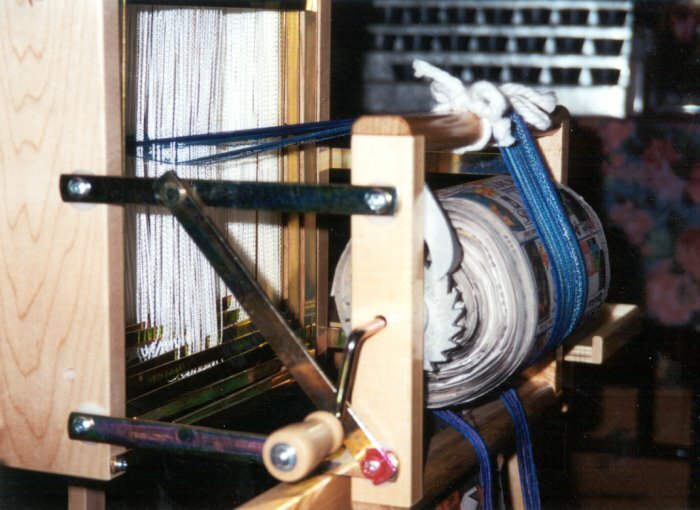 Both Looms will come with a special designed (1" profile) Cherry Shuttle, Reed and Heddle Hook, 2 Lease Sticks, 2 Beam Sticks, the newly designed Warp and Cloth Roll lashing system 1 Screwdriver, transfer Heddle Bars and the Book "Warp and Weave" by Robert Leclerc. Our Voyageurs are set up with Levers starting with #1 on the right(standard). 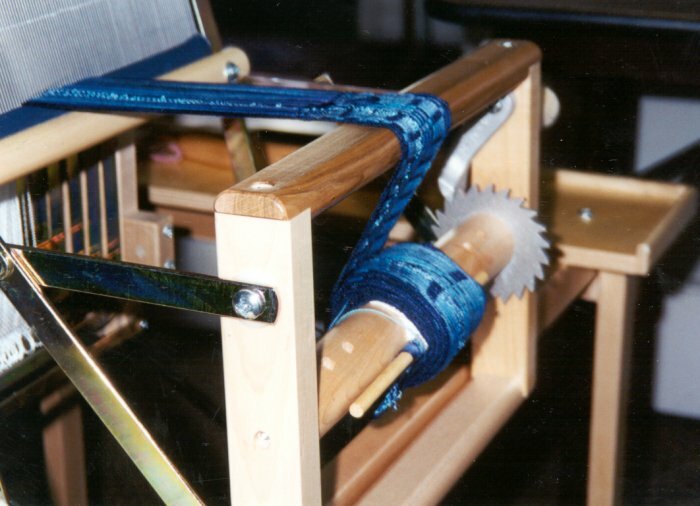 If you prefer we can set your Loom up with #1 Lever starting on the left at no extra charge. In addition for those that choose, Texsolv Heddles and the new Swinging Beater are available at no extra charge. For those that prefer even greater versatility, the Swinging Beater is also available in a Kit. The Beaters can be interchanged in a few minutes. Voyageur 8 Shaft Loom 9½"
Our new Voyageurs are set up with Levers starting with #1 on the right (standard). If you prefer we can set your Loom up with #1 Lever starting on the left at no extra charge. In addition for those that choose, Texsolv Heddles and the new Swinging Beater are available at no extra charge. For those that prefer even greater versatility, the Swinging Beater is also available in a Kit. The Beaters can be interchanged in a few minutes. "Latest Addition to the Voyageur Family of Workshop Looms"
In our ongoing effort to meet the Workshop Weaver's needs, Leclerc has expanded its family of Voyageur Looms to include a 12 shaft, 15 3/4" model. It has all the features demanded by the weavers around the world who helped us to develop our 8 shaft Voyageur, but now has the versatility of 4 more Shafts. The standard equipment remains the same-- stainless steel reed, inserted eye heddles (500 for the 12 shaft), color coded levers, choice of standard or swinging beater, our designer bag for carrying, and much more. As in the original 8 shaft model, weight and ease of folding were the most important considarations. Our new 12s weighs in at 25 lbs, and will fold to an easily moveable 19" x 11 3/4" (22 3/4" open) x 21". With its proven performance, we are confident that our new 12 shaft Voyageur is the best the market has to offer. 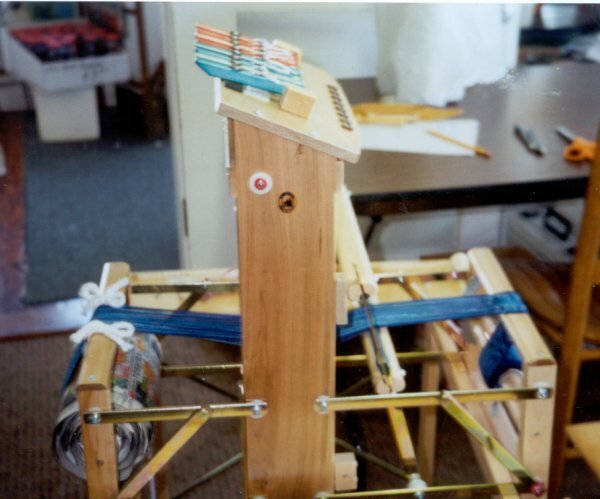 She wrote: This is the 9 1/2" Voyageur with 21 yards of warp on it. It is a fine warp of hand painted thread, 20/2 cotton set at 48 epi. We are weaving the award ribbons for the Florida Tropical Weaver's Guild Conference.